Being creative isn't only fun, but it is a hobby with many benefits. It is suggested that expressing ourselves creatively can prevent the urge to buy impulsively and save money. It not only gives you a deeper sense of fulfilment, but learning to make things can prevent the need to buy as much. It is also linked to helping to combat stress, and considered a form of meditation. I've never been one of those that excels in art, so I will never try to persuade any of you to make anything elaborate. However in my quest to get to know more creative hobbies I may enjoy, I have tried a few activities that sound appealing to me. I did it in my teens - trying to collect my gig tickets, gathering pictures of friends etc but somewhere along the way it has been lost. However, moving to Ipswich at the end of last year, I was keen to get involved in something new. This is where I came across two interesting classes with Craftability- jewellery making and scrapbooking. Although I think they are only local to Ipswich, I think it's always good to look things up locally. I simply searched for things I was interested in e.g. jewellery making, knitting and crochet and a few things popped up. I suggest doing the same! I'm working a lot of Saturdays at the moment and most of these workshops seem to take place on weekends. Since my necklace didn't survive a recent night out, I won't be discussing that. It wasn't that the class wasn't good; it was more of a reflection on my talents. The heart broke off and another part fell off later in the day. It didn't even last 24hours! I loved it! Like I said I'd done it before, but nothing fancy. Sticking pictures down, maybe decorating with glitter or given some kind of heading. The workshop taught me to use backgrounds, reminded me how to cross-stitch, putting shapes and even using double-backed tape (you can't underestimate my excitement there). It would probably be more fun to do a step-by-step process, but honestly can't remember it too much. It was all about getting the measurements right and adding my own touches. For example, the sample one only had two photos for this one, but didn't like the blank space. I also used different tools to make the paper curl round or stitching that circle was the longest; as I needed several different strings and threading that needle! I love the colours and different textures to try for this one. I also enjoyed using the stick-on pearls and would be tempted to use so many more! I made a glue mess on the graduation picture so covered it with a square and the snowflake. However think it now looks odd! I haven't done anymore scrapbooking, but would definitely attend another workshop as it was only £7.50 and just asked you to bring your own photos. You received teaching of techniques and use of appropriate materials. The workshops are on Saturdays, but the next one I hear I can do, I will be doing so fast. In the meantime, I need to print more pictures off and get scrapbooking! I hope you enjoyed my more creative post. I came across the Make it Monthly post by Whimsical Mumblings, and knew I needed to get involved. It was all about craft and sharing your wonderful creations. I thought it would be great to discuss my recent scrapbooking, and can hopefully encourage me to do more fun crafty things! For any bloggers reading, feel free to get involved in the fun. I'd love to read and be more inspired to be creative. Scrapbooking would be something I'd love to get into its just something I've not got around to doing. Im soooo not artistic but I love scrapbooking too - I think its hard to go wrong with cutting and sticking things that someone else has drawn or designed! And the finished article is such a beautiful thing to look at! I would love to get into Scrapbooking! I've bought the books and some materials, I just need to get some photos printed off and get on with it! Lovely scrap book - I don't think I have the patience. I have really enjoyed being creative with colouring recently, I'm so glad that came back as a trend. I took a scrapbooking class in high school and absolutely adored it. I actually still have all of the ones we made. I did a bit of scrapbook type things as a teen, but once I started my family it all fell behind. Being a full time mom is tiring. I'd love to get back into it, as family scrapbooks would have more meaning to me than those I did as a teen. I love being creative! I have scrap book supplies I haven't touched but need to set aside time! I'm glad you found something you love! I'm not very arty, but I do enjoy taking photos. I've recently ventured into scrapbooking to record life events and holidays :) it's very relaxing! Really good to always challenge ourselves and learn something new. I think we like to be comfortable as humans instead of going out the box. I've never really tried scrapbooking, but it always looked like so much fun! I'll have to give it a go with my daughter when she's a bit older! I love it so much! 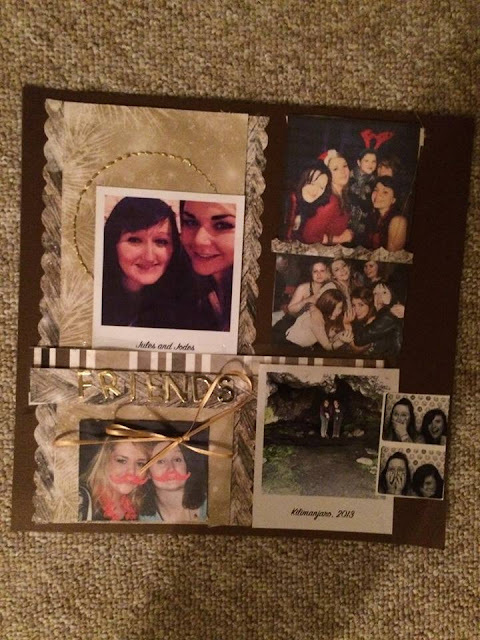 I've always wanted to get into scrapbooking but never quite got round to doing it! What a great course. I would love to attend a workshop like that and it was a reasonable price too. Love scrap booking too, I had one in my youth but it fell by the wayside. Wow! Your scrapbooking looks amazing, and such a great way to preserve memories and special events. I would love to give it a try! We haven't really done any scrap booking here but it sounds like a great idea with the photos. Scrapbooking is one of my long-time favorite hobbies. Now as I mother I am always making scrapbooks with photos of my children and I hope that one day they will really enjoy seeing them and showing their friends. It's always good to learn something new!!! Scrapbooking is really fun!! This is really cool! I Love scrapbooking and it was super fun when I used to do it. I have some nice scrapbooks of my daughter as a baby! I definitely need to set aside time to be more creative :) it helps me focus on not smoking - current goal! You've done an amazing job! These pages look so pretty! I would really love to take a craft class, I'm going to look into it right now! I being creative, decorating my planner and scrapbooking are just some of the ways I get creative. I love scrapbooking, have been doing it for about 15 years now and still love it! I haven't scrapbooked in years but would love to start it back up. I recently looked at my old scrapbooks and to was so fun to see all the amazing memories I experienced! Aaawww I used to love scrap-booking as a kid but haven't done it for years! I do keep everything though, like little keepsakes. I love the idea of scrapbooking, I just never have the time. A workshop sounds like a great idea. I'm hugely addicted to all things crafty - There's only budget and time that holds me back! I'm going to investigate whether I could join in with Make it Monthly too. Your scrapbooking is lovely! I have so many photographs, this is something I would really enjoy too. I love the idea of creative activities like scrapbooking. Its quite therapeutic doing arts and crafts! Getting creative is the best stress-reliever for me! I used to have a scrapbook, but now I've gone onto adult colouring books - best way to relax for me! aaah i miss crafting! It was the only thing that has led me to blogging! Great thing to write about perhaps ? I love being creative, and scrapbooking looks like so much fun! omg I would love to do this with my best mate! I have always considered scrap booking but never got round to it. IT would give a home to everything I seem to hold on to! Great post. I did a lot of scrap booking when I was younger. Need to find the time to do that soon. I haven't had much time for creative arts and crafts activities. Yes, my writing is creative, but I feel there is a difference. Some of the creative arts and crafts activities I have enjoyed doing include quilting, crocheting, and DIY house projects. I really love these ideas - occasionally I get really creative and always enjoy it but life seems to move so fast! Don't be a bitter single!